In the ever changing technology landscape, TVs are becoming internet based. 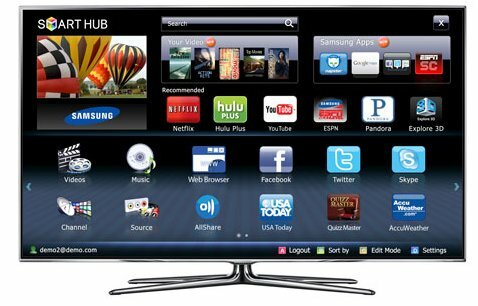 A Smart TV is one with a built-in computer, Operating Software and Internet connectivity. There are several ways to get internet content on your TV. This content includes Netflix, Youtube, Facebook, Twitter, TV shows, Skype, Pandora, VUDU, Amazon video-on-demand, News, Sports and more. 1) LAPTOP/PC connected to internet and displayed on a TV. PROS: Unlimited web access. The TV is just used as a big screen monitor. 2) SMART TV - Internet ready with apps. Note: not all apps are available on every TV manufacturer. Additional purchases may be required, examples: storage such as USB drive for apps or remotes with keyboard for surfing web. Samsung, Sony, Panasonic, LG, Vizio, Toshiba and Sharp. Each markets under a different name. A few apps are offered across the board by most TV makers like Netflix, Facebook, Twitter, Pandora. 3) MEDIA PLAYERS. ROKU, Apple TV, Western Digital WDTV and other internet content add-ons (or IPTV) allow any TV* to access many internet sites such as Netflix, YouTube, Pandora, Amazon VOD and more. *Some internet media boxes only have HDMI outputs while others have a full compliment of outputs which allow hookup to older TVs. ROKU and Western Digital internet media players have wi-fi and HDMI as the above connection diagram shows. The players have a remote to control your selections from internet sites. ROKU: Connect to your HDTV with HDMI or connect to your older TV with composite video cables. ROKU boxes have wi-fi (b,g,n) to transfer data to/from a wireless router. Cost is $50 to $100 retail depending on model. More and more, TV and internet are merging. Your cable or satellite TV provider has been the source of TV content but the internet is opening up a wide range of information and entertainment not seen before. Some TVs are now internet capable with wireless built-in. Older TVs are not left out, as attached box internet "players" such as Apple TV, ROKU, Boxee, Western Digital and others are available for movies and music. The ROKU box and Western Digital WDTV Live Hub allow older TVs to connect using composite video and audio hookups. Each manufacturer offers a unique bundle of free or paid services, including streaming video and music, social networking apps, online photo galleries, news and financial updates, weather info, sports scores, and a variety of other smartphone-like applications. For internet access you need a broadband internet setup. Laptops or internet ready TV all need access using a broadband connection from your provider. This involves a router (wireless or wired) and modem (cable or DSL) in your home. Laptops have wireless capability for internet access. The newest HDTVs also have built-in wi-fi. Your wireless router (about $50) and modem (from your provider) allow internet access. Some of the cost to access internet content is one-time while others are on-going. Internet broadband service - Monthly cost typically $30 to $60 paid to your provider. One way to get the Internet on your HDTV is to set the HDTV up as a computer monitor through a direct cable connection. 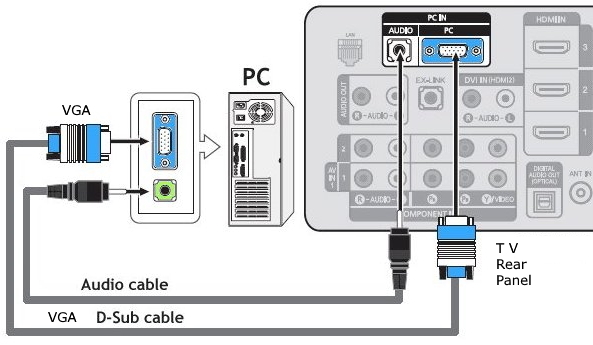 It's important to make sure your computer and HDTV have the right outputs and inputs to make this setup work. The most common--and best quality-- inputs on HDTVs are HDMI and component video cables. Unfortunately, outputs for these are quite rare on personal computers. Virtually all computers have a VGA output--it's the blue color-coded cable that's connected your PC to its monitor for years. It's perfectly capable of supporting high-definition video, and most HDTVs feature VGA inputs. See laptop to tv setup for more information. Neither VGA nor DVI carry audio. A separate phone-to-phone cable, which connects your computer's audio line-out and your TV's audio input, will be necessary. Once the cable issues are all sorted out, you must set your computer's screen resolution to match the native resolution of your HDTV (either 1920 by 1080 pixels for 1080p sets, or 1280 by 720 pixels for 720p sets). If your computer can't attain such resolutions, it's possible to work around the limitation with special software, but that's venturing into dangerous territory. Proper resolution settings ensure your computer's desktop will fill the screen properly. With that done, you can browse the Web for videos just as you would normally. If this seems a little too complicated, there are other solutions available. Another way to make your HDTV Web-enabled is to purchase an accessory that acts as a bridge between your HDTV and the Internet. These devices have all the necessary outputs (HDMI) and the right inputs for Internet connections (Ethernet or wi-fi). Other devices, known as "digital media receivers," are a little more versatile. Apple TV ($299) is meant to be a complete home entertainment solution, providing access to your home network as well as the Internet. Apple TV has a quick route to the iTunes store for rentals or purchases of high-definition TV shows and films. It also has YouTube access and lets you watch photo slide shows from Flickr. The Sony PlayStation 3 ($399) also has digital media receiver capabilities. The Sony PS3 can use wi-fi to connect to the Internet, and though it's not as robust as Apple TV, it's possible to watch online video and get onto the Web through the console's browser. Hewlett-Packard and Panasonic have taken things a step further by building Web connections right into the HDTV. HP's MediaSmart TVs have integrated Ethernet ports and wireless cards, making it easy to connect to your home network. The MediaSmart interface not only provides a link to YouTube, it also allows you to view all the media content on your computer's hard drive--photos, music and video--on a television. It's also possible to rent or buy movies in high-definition right from the TV screen. HP put all these features into the HP MediaSmart Connect ($349.99), a digital media receiver that can be used with any brand of HDTV. Panasonic's Viera Cast is a new feature of the brand's higher-end plasma televisions. Currently, Viera Cast provides access to YouTube, Google's Picasa photo sharing service and Bloomberg News. It can be found on the Panasonic models, which connect to the Internet via Ethernet cables. These integrated solutions are perhaps the most exciting, as they signal that television manufacturers understand the allure of Internet-connected HDTVs. 2009 saw the introduction of internet capable HDTV and although currently there are some limitations, it would seem the possibilities are almost unlimited. New TV sets and new websites promise profound changes to the TV landscape. Sony, Samsung, LG and Vizio all said they will produce TVs in 2009 that can display Yahoo's TV Widgets, software that any website can use to deliver content from the Net. TV Widgets include eBay, Twitter, Facebook, CBS interactive, YouTube and more. In short, "cable ready" has given way to "Internet ready." Granted, the sets typically limit consumers to a finite number of web sites chosen by the manufacturers. Their arrival nevertheless portends profound changes for the future of television. Internet-ready sets weaken the hold that cable and satellite TV operators have over their customers by enabling viewers to receive much of the value of their services for free. Online video sites such as Hulu are already aggregating popular broadcast and cable TV programs, which they deliver mainly to computer screens. Once the average living-room TV can tune in those sites as easily as NBC, viewers may be hard-pressed to justify paying $80 a month for the few shows or networks they can't stream for free from the Net. And cable and satellite operators may find themselves having to cut rates after having increased them steadily for years. Plugging the internet into TVs and providing open platforms such as Yahoo Widgets means that anyone with a camcorder and a computer will be able to reach the global community. Demand for Internet-enabled televisions is growing rapidly, according to a new study by the Consumer Electronics Association. The study reveals numerous ways consumers would use an Internet-enabled TV. Having anytime-access to content, and accessing the Internet and television broadcasts together were the top benefits of an Internet-enabled TV, according to consumers. The study also found that most adults are already online while watching TV. Almost a third of online adults say they always or usually surf the Internet while watching television and another third say they sometimes do. Consumers are increasingly willing to shift online activities to the TV. With the WNCE2001 Universal WiFi Internet Adapter, you will no longer need to buy individual proprietary WiFi dongles for the TV, Xbox, etc. because WNCE2001 works with all of them. You can simply plug it into the device when you need to and share it among multiple gadgets. Vizio is based out of Irvine, CA. Vizio is looking to make the Television the next big internet device. While in the midst of creating this vision, they are also creating a wealth of opportunities for developers and a whole new world for consumers. Vizio's plan is to make their TVs interconnected with the net. What this means for consumers is limitless. Vizio is of the understanding that they can make television a robust internet platform just as the PC and the mobile phone have become. Vizio isn’t just slamming Ethernet cords in the back of TVs. They’ve installed top of the line 802.11n on many of the new XVT series TV sets. Considering that everybody doesn’t have their router positioned near their television, a Wi-Fi enabled TV is a welcome addition. Vizio is going even further than connecting to the internet. They are supporting Yahoos Widget Channel and Adobe Flash apps. Developers can build an amazing interactive world with TV users. Many big name companies have announced support for the Yahoo channel, but Vizio is the only company that supports both Yahoo and Adobe. Vizio will have a program within the TV which allows users to use Adobe or Yahoo apps on the same interface. 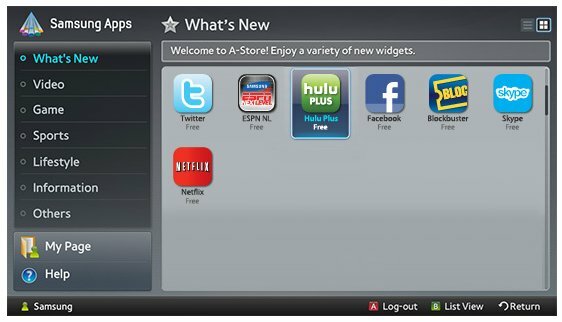 Some of the companies that have signed on to produce widgets include but aren’t limited to Facebook, Twitter, EBay, Showtime, Netflix, and Rhapsody. Vizio’s goal isn’t to try to recreate the experience that takes place on the PC, but do develop an individual environment that is similar to that of the iPhone. Vizio's "Connected HDTV" platform includes new models that offer Netflix OnDemand, Blockbuster OnDemand, Amazon Video, Rhapsody music, and Flickr photos. Vizio TV models include a 55 inch LED HD monitor. It will offer an integrated 802.11n WiFi connection, an integrated sound bar and the latest Yahoo! TV widgets. The TV will come equipped with 2GB of flash memory as well as a Bluetooth remote that has a QWERTY keyboard similar to that of a T-Mobile Sidekick or a Blackberry. 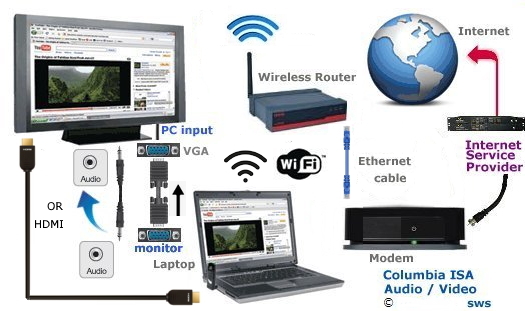 What is an Internet Connected HDTV? 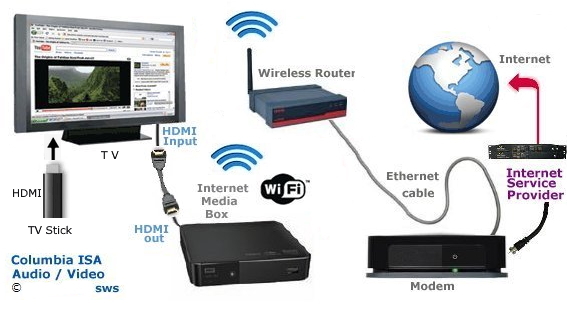 The new generation of Internet capable HD television sets (also called Broadband HDTVs) have a true ethernet port (or wireless adapter) that connects them directly to your router. So your television is truly "on the Internet." This enables the integration of entertainment services like Netflix and Yahoo TV Widgets with your television. You can use on-screen widgets to watch stock prices, keep track of sports scores, play online games, shop on eBay, even view a web video, while watching your favorite TV show. Think of it as a combination of picture-in-picture and those little banners that display various types on info on news, sports and financial channels. But widgets are interactive and customizable. You decide what happens, and it doesn't matter which channel you're watching. Samsung, Vizio, Sharp, Sony and Panasonic have recently announced Internet connected HDTV sets that will bring you high-definition movies, music and other online services on demand. Samsung Apps is a growing collection of premium web-connected apps specifically built for your TV that connects you to your favorite digital content such as movies from Netflix or Blockbuster, TV shows from Hulu Plus, videos from YouTube, Next Level sports information from ESPN, music from Pandora, and social updates from Facebook or Twitter. These apps let you download and or stream content in real-time from movie and TV libraries. Miss your favorite Thursday night TV show? With Hulu Plus™ you can watch recently aired TV shows from networks like ABC, Fox, and NBC—on your own time. Through Flickr(R), Yahoo! 's online photo management and sharing application, consumers can enjoy their latest family and friend photos on the big screen. Accessible through a Yahoo! TV Widget, consumers can access this unique photo sharing site to run slideshows and view individual photos. As a leading online video community for people to discover, watch, and share originally created videos, YouTube allows consumers unlimited access to web based videos. Through LG's alliance with this prolific online video community, consumers can instantly stream millions of Web videos directly from the Internet for viewing on their television. LG's HDTVs with NetCast Entertainment Access will join the LG BD300 Network Blu-ray Disc Player as an industry first, providing the ability to stream movies instantly from Netflix, offering consumers a variety of ways to enjoy more than 12,000 choices of movies and TV episodes. Netflix members owning one of these devices pay as little as $8.99 for a monthly subscription for unlimited streaming and DVD rentals. Instant streaming content from Netflix to the HDTV will rely on a broadband connection and Queue-based user interface. Netflix members will use the Netflix Web site to add movies and TV episodes to their individual instant Queues. Those choices will automatically be displayed on members' TVs and available to watch instantly through the HDTV. Once selected, movies will begin playing in as little as 30 seconds. With the accompanying remote control, Netflix members will be able to browse and make selections right on the TV screen and also have the ability to read synopses and rate movies. In addition, they will have the option of fast- forwarding and rewinding the video stream. LG will be the first to introduce broadband HDTVs with the instant-access high-definition (HD) movie service from VUDU Inc., a leading provider of digital on-demand entertainment services. 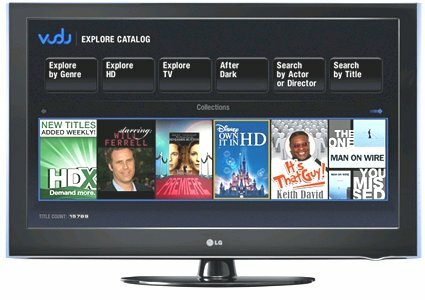 VUDU on-demand movies will be available on LG's LH50 1080p LCD series and PS80 Plasma 1080p series with "NetCast Entertainment Access". The VUDU service allows consumers to instantly buy or rent from an extensive library of movies and TV titles, including an industry-leading catalog of more than 2,000 high-definition movies - with no monthly fees and without having to buy, install, or connect any additional hardware. VUDU's streaming movie service delivers a near-instant viewing experience - movies start immediately, including high definition HDX movies, and viewers can fast forward, rewind and browse chapters without the delays or the frustration associated with slow buffering. The VUDU catalog is updated weekly, and newly released movies from major studios are typically available months before they are available on subscription-based services. Users can also choose to incorporate the NetCast-equipped HDTV into a home network to access JPEG photos or MP3 music files stored on their home PC to create slide shows and listen to music on their big screen. LG Electronics USA, Inc., based in Englewood Cliffs, N.J., is the North American subsidiary of LG Electronics, Inc., a global force and technology leader in consumer electronics, home appliances and mobile communications. http://www.LGusa.com. 2009 is the model year that internet connected HDTVs hit the market in a big way. You can also expect the availability of more and more useful widgets, since most vendors offer programming toolkits that allow people to develop their own. As the technology becomes more popular it will evolve and users will have more options to choose from in regards to Internet content and widgets. TV Widgets change what it means to Watch TV. TV Widgets deliver a Cinematic Internet™ experience by converting your favorite Web services like Yahoo!® Finance, eBay®, CBS, Flickr®, USA Today®, and Twitter®, for the TV. View episodes of your favorite CBS TV shows, watch a movie, check the latest news and sports scores, shop on eBay or catch up with your friends on Twitter. It’s easy—just grab your remote, lean back and stay connected. Enjoy Internet content while watching your favorite TV programs. TV Widgets allow you to interact with your favorite Web services while you watch TV. Press one button on your remote to bring up the TV Widget Dock, select a TV Widget, and view content without missing a moment of your favorite TV show. No more arguing over the remote, as everyone gets to enjoy what they want at the same time! You can check out the latest news from the New York Times®, while other family members are still enjoying the TV show. Personalize your experience with a selection of TV Widgets. Every member of the household can create a profile of their personal selection of TV Widgets. Go to the Yahoo! Widget Gallery and add widgets to your profile for Mom, Dad and the kids. With each TV Widget you can also create a Snippet or shortcut for quick access to the content you want. By pressing your remote, you can connect directly to your friends' photos on Flickr, buy an item on eBay or see an episode of your favorite CBS TV show. Easy access to the best of the Web. It’s easy to enjoy Internet services, information and community through TV Widgets—compact Internet applications that deliver the best of the Web to your TV. View movies, video clips, news updates, photos, messages, and more with TV Widgets. Go to the Yahoo!® Widget Gallery and choose from a growing list of TV Widgets; soon to include Yahoo! properties such as News, Weather, Sports, Video and Flickr®, as well as popular providers like The New York Times®, eBay®, CBS, and Showtime®. Get access to top headlines, photos, and stories from The New York Times, on your TV. Send news stories from your TV to your mobile phone. Browse, find and enjoy great movies with the Netflix widget—a personalized, convenient way to rent and watch movies on your TV. View thousands of movies—from new releases to the classics—in DVD quality; on demand and on your TV. It’s easy to rent or buy the best of movie, TV, and music video entertainment on TV with the CinemaNow TV Widget. Track fantasy league scores, standings, and player stats in real time, while you watch the games on TV. Get the latest sports scores, stories, and snapshots, as the news happens from USA TODAY on your TV. Play popular interactive and multiplayer games across the Internet through your TV—QuizMaster trivia, Texas Hold'em Poker, and Sudoku—with Funspot. Share photos with family and friends, browse the latest photos posted by the worldwide Flickr community, or watch a slideshow; all on your TV screen. Get breaking news, headlines, and top stories from leading news sources, designed for the big screen. Get stock quotes, business news, and market updates—plus fast access to your Yahoo! portfolio, on your TV. Choose a location and get a snapshot of current weather conditions, the 5-day forecast and more, on your TV. Get updated sports scores, updated stocks, even view full-screen photos from family and friends. Available soon will be widgets from Accedo Games, Twitter, Yahoo Video, eBay, USA Today, Yahoo Sports, Showtime, CBS Entertainment, the New York Times, and CinemaNow. Others that have announced plans to develop widgets include Disney/ABC, MySpace, Viacom/MTV, Netflix, Amazon, Blockbuster, Associated Press and Joost. The Samsung TVs also come with a built-in "content library" containing "photo art gallery, games, workout routines, recipes and other interesting digital content." Despite being called widgets, which are generally defined as snippets of general-purpose code, Yahoo's widgets are actually proprietary mini-apps like Vista's Sidebar gadgets. It's an icon and a little bit of software behind the icon to connect to the Internet, sitting on your TV. Most widgets will be free. Nobody just wants the Internet dumped on the TV. Samsung TVs have no general-purpose Internet browser. A TV Widget is a small web application that allows you to easily access your favorite site using the remote control. You can enjoy various types of information, such as the latest news, weather information, and stock information, etc. on your TV along with your friends or family members. Some widgets may not be supported depending on the regulations of the corresponding country. Some widgets will only support limited services depending on the regulations of the corresponding country. The color buttons may work differently depending on the widget. The operation may not be smooth depending on the network condition. The Snippet is a symbol of Widget. A snippet shows a part of the Widget contents such as weather and stock information that the user wants to view. The snippets are automatically updated in real time. It may take a few seconds to load the snippet. 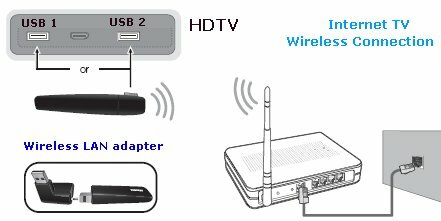 You can use a wired or wireless connection on many HDTVs. Wired uses the RJ-45 jack in the HDTV and connects with an Ethernet cable while wireless uses the USB port in the HDTV. A wireless dongle fits in the USB port and sends data to your wireless router. Be careful with compatibility as typically the USB wireless adapter is proprietary and will only work on the same manufacturers HDTVs and even then, only some models. • RF Modulators and DVD Connections. More options for video and audio connections.